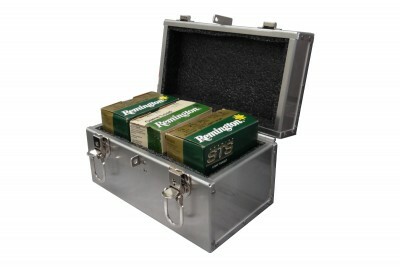 The AT-805S ammo box is the perfect alternative when you need something smaller to carry less ammo. Designed to carry up to 2 boxes of Dangerous Game sized ammo, this case has two locking latches, a padlockable hasp, and a convenient carry handle. Rugged yet lightweight, the short ammo box meets travel regulations. Interior Dimensions: 8-1/4" x 4-3/8" x 4-3/8"
Exterior Dimensions: 9-1/2" x 5-1/2" x 5-1/2"